Flying 5,000 miles from Melbourne, Australia to Tokyo, Japan it only took 9 and a half hours to find myself in an entirely different hemisphere, culture, & cuisine. Trekking first from Tokyo’s Narita airport to Hamamatsucho staton in the central Minato district, we quickly dropped our bags and started on our to do list for 48 hours in Tokyo. Much like other major cities in the world, Tokyo is incredibly overwhelming. From the towering buildings, to the confusing language, to the incredibly intricate and impossible metro system, Tokyo made New York seem like a simple small town. Hopping in a taxi and racing first to the Sompo Japan Museum of Art (before it closed), we were able to catch a glimpse of one of Van Gogh’s five famous sunflower paintings. (The rest of Van Gogh’s sunflower paintings can be seen around the world at Neue Pinakothek in Munich, Germany, the National Gallery in London, England, at the Philadelphia Museum of Art in Philadelphia, PA, and the Van Gogh Museum in Amsterdam, Netherlands). Losing ourselves afterwards in Tokyo’s underground train system, we eventually escaped the metro and stepped out into a world of windy streets and bright billboards in Tokyo’s Musashino district. While quite a trek from central Tokyo, the journey is well worth it for a dinner at the famous Satou Steakhouse. Strolling around Musashino afterwards, taking in the sights & the markets, we grabbed some macha ice-cream and eventually crawled underground to head back to Minato. 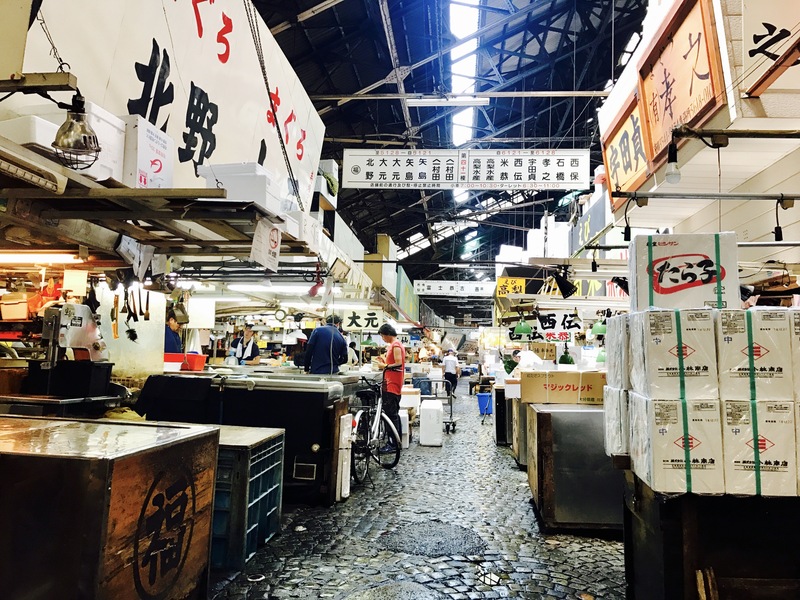 Starting day two in the 100 degree Tokyo heat with a walk to the Tsukiji Fish Market, we were completely unsure as to what to expect. Enclosed in a warehouse that seems to go on forever, Tsukji showcases some of the largest, scariest fish in the Pacific Ocean. Entering the market and first ordering some sushi in a closet sized restaurant for breakfast we ate our sashimi and then began browsing the market. While gallons of fresh fish, salty water pooling on the ground, and the risk of a fishing truck running you over at any time, it sure is an adventure! Trading the fish market for a tour through Tokyo’s other central districts, we started in Chuo, and wandered, rickshaw-ed, & subway-ed our way through Chiyoda, Shinjuku & Shibuya, passing dozens of shrines and Sunday markets along the way. Finishing our sightseeing in Tokyo by visiting the Imperial Palace, Meiji Jingu Shrine, and Tokyo Tower our 48 hours came to an end as we hopped on the Shinkansen and headed for our next Japanese adventure in Hakone & Kyoto.